Fabio Capello will announce who will be England's permanent captain before they take on the Czech Republic in August. The England manager has used five captains during his first four games in charge with Rio Ferdinand the first to take the armband against Switzerland. Since then Steven Gerrard, John Terry, David Beckham and Gareth Barry have all been made captain by the Italian. "I will decide in the last week before we play Czech Republic - I have not decided yet," he told BBC Sport. 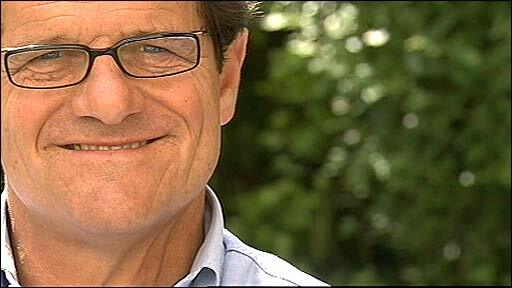 Capello has also revealed he had concerns regarding England's squad after his opening game in charge. England won that game 2-1 with a less than convincing performance and lost to France in his next encounter. They have since beaten the United States 2-0 and Trinidad and Tobago 3-0 and Capello believes that they are slowly moving in the right direction. "I now know a lot of players better and they also know me better," said the 53-year-old. "When I started the first game against Switzerland it was not easy because I saw a lot of problems; there was no confidence and they did not play like they do for their clubs and that was very strange for me. Are England heading for a brighter future under Capello? "Now, I am very happy because step-by-step we are moving along and we play better in every game." He added: "The player now knows what I ask him and the movement without the ball is very important and also the positioning on the pitch. "I'm very happy because I saw good movement on the pitch, not for 90 minutes, but in different periods in the game." When asked about England's past failures, Capello said he could not understand the reason for previous below par performances. "I do not understand why," he said. "This is a big problem and it is very interesting to understand why - I think it is not having confidence. "But the player's technical ability surprised me because always when I played against English teams they ran around, were very strong, and good in the air but they were good technically. "I saw a lot of players who are very good technically. But I don't understand why, when players play for the national team, they don't play like they do for their team. "It's possible that the England shirt is too important and they don't play with the same confidence."